Bananas are the one fruit I know my children will happily eat. They're a staple item for our weekly online shop, great both as a snack or served as a quick dessert with squirty cream and sprinkles. Unfortunately I often buy more bananas than we can eat, or they ripen too quickly and are left in the fruit bowl with their skins growing blacker. While overripe bananas are incredibly sweet, their appearance is a great put-off - after all, children far prefer their fruits to be brightly coloured and fun! Feeling frugal, I dug out an old recipe for banana bread yesterday to use up those unwanted fruits. It went down so well I deliberately ordered more bananas than we need for this week's shop so I can make it again at the weekend. 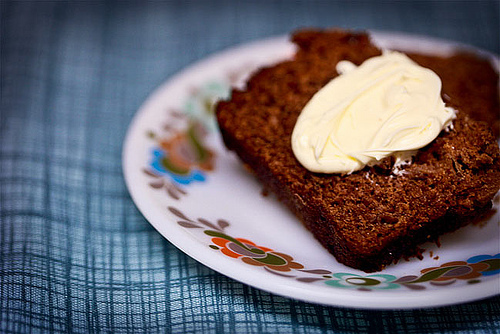 Here follows our fabulous frugal recipe for sweet banana bread, which tastes wonderful on it's own or can be served for dessert with a generous dollop of crème fraiche. Melt the butter and sugar together in a saucepan over a low heat. Remove from the heat and cool slightly. Add the mashed bananas and mix well. Add the egg and combine until all ingredients are incorporated. Gradually add the flour, followed by the milk and combine. Pour into your prepared loaf tin and if desired, sprinkle a little more sugar on top to give it a little crunch. Bake for about 35 minutes, or until a skewer comes out clean. Leave to cool, slice and enjoy! Do you have any favourite recipes for using up fruit which would otherwise be wasted? Please share your thoughts and suggestions in the comments section below.